LCA Mk2 is being developed for use by the IAF and the IN. The decision to develop a Mk-2 version of the LCA was taken in September 2008, when it became clear that the Kaveri engine would not be ready in time for LCA IOC, and the aircraft would have to be inducted into service with the lower thrust GE-F404 engine and consequent performance shortfalls. LCA Tejas Mk-2 would be the aircraft that the IAF had sought with the LCA project and the IAF would have to make do with the under performing LCA Mk-1. Completely out of options, the IAF agreed to induct two squadrons of LCA Mk-1, an aircraft that it didn't want, in the hope that the money paid would fund development of the LCA Mk-2. Six years since the decision to develop LCA Mk-2, even the design of the aircraft hasn't been finalized. Ironically, the reason for the tardy progress of the LCA Mk-2 project is that ADA has been focused almost exclusively on pushing LCA Mk-1 through its IOC and FOC! LCA Mk-1 has overshadowed LCA Mk-2. Will it continue to do so? Is the IAF once again going to be short changed by DRDO and HAL laid back work culture? Hope is not lost, but the promise of LCA Mk-2 has a deju vu tinge reminiscent of sales pitch that we have been suckered into. With the current rate of progress, even if we let our optimism run amok and completely ignore ADA/HAL past record, operational induction of LCA Mk-2 into the IAF is at least ten years away. How good is that? Ten years from now, the PLAAF would be inducting J-20 stealth fighter bombers, and the PAF J-31 stealth fighters. What advantage would a small sized but easily tracked fighter with limited range give to the IAF then? Maybe I am over-reacting. I admit to having written a blog post over ten years back suggesting that ADA treat the LCA project as a technology demonstrator, the way it was conceived, and focus on developing a more capable fighter. The post was panned by the folks at drdorakshak.com bharatrakshak.com, often with liberal use of expletives. Since I do have dubious credentials, in the rest of the blog post I will just present what is officially known about the LCA Mk-2 project. Hopefully, that will leave readers in the same cheerful frame of mind that they were in when they start reading the post. According to DRDO Chief Avinash Chander, preliminary design of LCA Mk-2 had been completed and ADA is now validating the design. Last year, ADA was known to be scouting for a consultant to help with design validation. I am not sure what became of that, but a DRDO official told IDP Sentinel that ADA was ready to proceed independently failing a satisfactory consultancy arrangement. ADA-HAL are designing LCA Mk-2 using DFMA (Design for Manufacturing and Assembly) methodology, which ensures that aircraft components are designed to ensure easy manufacture, without adversely impacting the ease with which they can be fitted on the aircraft. The first time use of DFMA methodology in designing an aircraft would ensure better quality and quick ramp up of serial production after IOC. LCA Mk-2 will be powered by the GE-F414-INS6 engine, a variant of the GE-F414 engine developed for the Boeing F/A-18E/F Super Hornet. 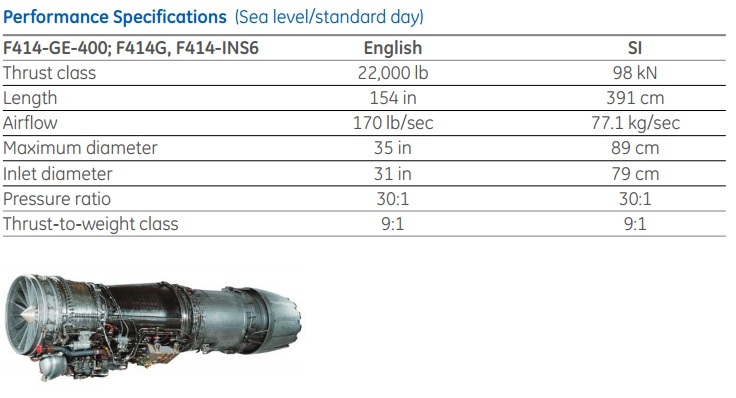 The 22,000 lb thrust class modular engine features a 35 percent increase in thrust over the GE-404 engine. Advanced engine features include a Full Authority Digital Electronic Control (FADEC) for better operational characteristics and advanced materials and cooling techniques for improved performance and extend component life. ADA is procuring 99 GE-F414-INS6 engines to power the Tejas Mk-2 and LCA Navy, for which a contract has been finalized and approved. Under the contract, GE would ship 18 engines with the remaining being manufactured in India by HAL under transfer of technology [agreements]. The 18 engines will come by 2014-15. India will have the option of ordering another 100 engines in the future. Minor modifications are being made to the LCA Mk1 airframe to accommodate the slightly larger E-F414-INS6 engine. The fuselage is being being extended by 500mm. It is reported that redesign of the airframe to fit the F414 engine would eliminate the need for the dead weight lead plates fitted on the Mk-1 in order to ensure stability of the aircraft. It is proposed to have two 6x8 smart MFDs on LH, RH and one 5x5 MFD in center console in Tejas Mk2. LCA Navy will be based on the LCA Mk-2 aircraft. Initial development of the LCA Navy, using Shore Based Test Facility (SBTF) at Goa, is being done using prototypes (NP1, NP2, NP5) developed from LCA Mk-1. Carrier trials would be done using prototypes developed from LCA Mk-2. Only LCA Navy Mk-2 aircraft will embark on a carrier. Initially, ADA planned to develop one twin seater trainer (NP1) and one fighter (NP2) along with Shore Based Test Facility (SBTF) at Goa.